So you've had a good start, stayed in clean air as much as you can, and have tried to stay with the leaders. And you may notice that if the first leg is one mile long, then half way up the leg it's also one mile wide. So the fleet often spreads out to give you more room to find clean air. But then something terrible happens - in the second half of the leg the fleet comes together to round the windward mark. And then all hell can break out. Think about it - the starting line might be several hundred feet wide, but all of those boats have to squeeze through a space only 10-20 feet wide. From up to a mile wide to just 10-20 feet! And some of the leaders will make things even worse because they'll round the mark and then head downwind straight at you screaming. Here's what a middle-of-the-fleet sailor has to consider. And as an example, we'll take the worst-case scenario of rounding onto a run with no offset mark (rounding with an offset or onto a reach are easier). is on starboard tack approaching the mark. is on starboard tack and has rounded the mark. is on port tack approaching the mark. is on port tack and has rounded the mark and jibed. always has rights and can head straight for the mark. has rights over 3 and 4 because they're on port, but if 2 jibes like 4 then it has no rights. only has rights over 4 because 4 is to windward. has no rights at all and must keep clear from everyone. The ideal path to take is shown in green - starboard into the mark area and starboard out of the mark area. Avoid port-tack approaches to the mark. A boat rounding the mark is permitted to cut right in front of you because that's its proper course, so you have to anticipate this and stay clear. When you round the mark and would want to jibe, sail by the lee instead to stay on starboard. This way, you'll at least have right of way over the boats approaching the mark on port. If you round the mark and must jibe onto port, realize that you have no rights. Don't forget to verbalize what you're doing. Saying things like "I have room coming up" or "I'm bearing off" or "hold your course" avoids confusion and is appreciated by those around you. I've sailed against people who are very aggressive at marks and do things like bear off to head straight downwind knowing that there are boats on port tack going upwind that have no chance of avoiding them. This is quite selfish because they really would not lose any distance by sailing on a broad reach until there's a place to bear off. It's much more fun sailing with people who try to cooperate. The managed chaos can actually be really fun. With a good mark rounding, middle-of-the-fleet sailors now prepare for the part of racing where the big gains (and losses) occur - downwind. 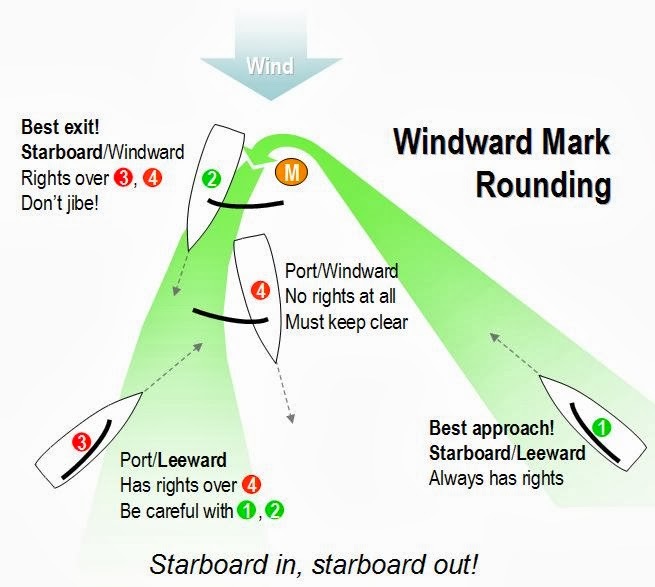 But can you clarify something - concerning port-tack approaches you say "A boat rounding the mark is permitted to cut right in front of you because that's its proper course". 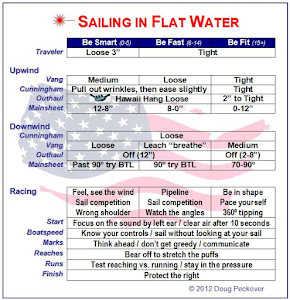 It sounds like you are referring to a mark rounding rule, but Rule 18 doesn't apply to boats on opposite tacks on a beat to windward. What am I missing? To be candid, Rule 18 changed this year and I have not discussed this with rules experts. 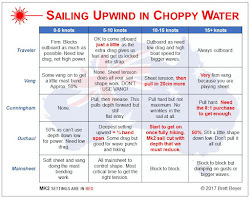 Perhaps we can get some opinions on this (see http://www.sailingworld.com/experts/important-rule-changes-mark-room). 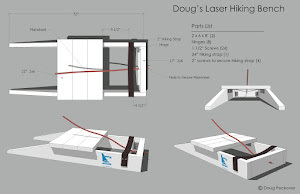 One of the worst accidents I have seen in Laser racing (in the sense of the seriousness of the injury to one of the sailors) happened in just those circumstances, 2 vs 3 using your numbers. And to your last point, it does make sense for the starboard boat bearing away to avoid the port tackers approaching the mark even if they do have rights over them. In the example I am thinking of it was the starboard tacker who ended up in hospital. Ouch. I'll be giving an interesting example from a Worlds that shows that going around boats on port tack does not really cost you anything. Look Who Just Turned 50!